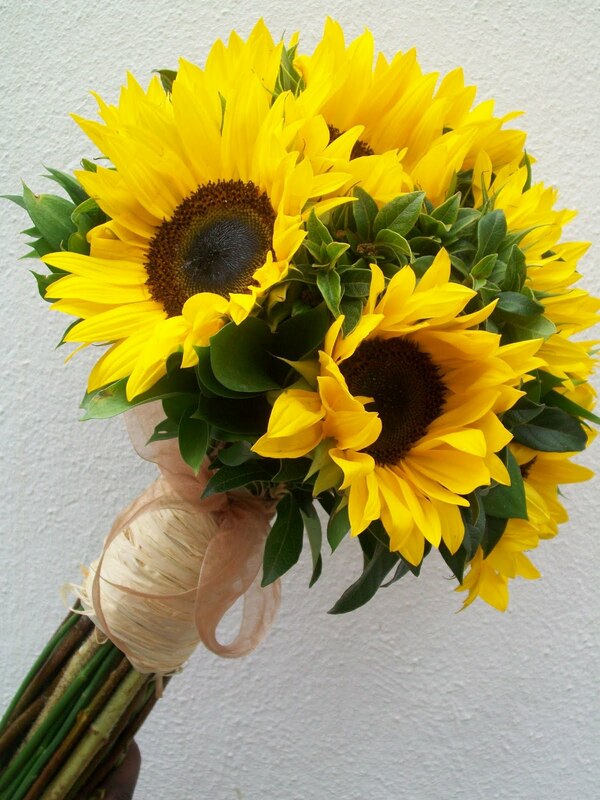 Sunflowers bring the summer sunshine inside to your wedding. Sunflower wedding bouquets are inexpensive, stunning and are sturdy enough to last through the ceremony, wedding reception and even into the next day. Sunflower wedding bouquets come in different sizes and colors. You might think that the cheery yellow flowers are your only choice. Think again. Colors include pink, orange, maroon and variegated as well as the classic bright yellow. Some of the blossoms go from light pink on the outer edges of the petals to dark red as they approach the center. Sizes of the blossoms range from only 3 inches in diameter to the giants of 12 inches -- which of course are unwieldy for sunflower wedding bouquets. If you have the space, or friend or relative does, grow some of the larger sunflowers to use at the entryway to the ceremony or church. Create a sunflower wedding bouquet using several different sizes of sunflowers. Or use the sunflower as the showpiece of the bouquet surrounded by other country garden flowers. Good choices include purple cone flowers, black-eyed Susans, bachelor buttons and Queen Anne's lace. Another idea is for the bride to carry a mixed bouquet and each bridesmaid to carry a bouquet comprised of one of the flowers in the bride's bouquet. In the example above, one bride could carry purple cone flowers, another a bouquet of black-eyed Susans and so forth. Since sunflowers are stunning, you don't need to have masses of them to create a country garden effect for your reception. Arrange three large sunflowers in a tall vase. Wrap the vase with a raffia bow and you're done. A basket of sunflowers is easy to make and for the bride to carry. Line the basket with waterproof plastic. Fill with floral foam. Cover the foam with sphagnum moss. Cut the stems of the sunflowers to all one length that's about 2 inches shorter than the depth of the basket. Push in the stems in the foam so the heads of the flowers are close together. 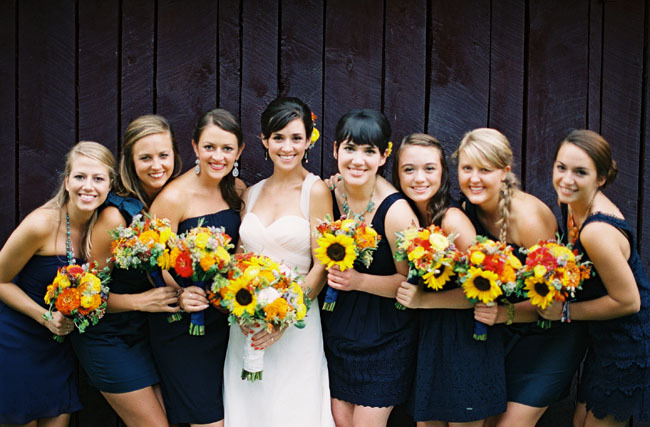 Each bridesmaid carries one sunflower. Making a hand-held sunflower wedding bouquet takes no time at all. Sunflowers face to the side rather than upward, so keep that in mind when assembling the bouquets. Place a group of sunflowers in a large glass jar. Wrap the stems with rubber bands placed about 3 inches apart. Cover the rubber bands with ribbon. Tie the ends of the ribbon in a big bow. Keep the bouquets fresh by placing the stems in a few inches of water. Echo the sunflower theme by handing out packages of sunflowers seeds to guests. Paint sunflowers on glass votive candle holders. Fill with white candles and place around the flower arrangements on the tables. Wire a silk miniature sunflowers to cheap napkin rings for the reception table. Decorate the wedding cake with sunflowers made from frosting.